Alice Rawsthorn is an award-winning design critic and the author of critically acclaimed books on design, including Hello World: Where Design Meets Life and, most recently, Design as an Attitude. An influential public speaker on design, Alice has participated in important global events including TED and the annual meetings of the World Economic Forum in Davos, Switzerland. Her TED talk has been viewed by over a million people worldwide. Based in London, she is chair of the boards of trustees at Chisenhale Gallery in London and The Hepworth Wakefield in Yorkshire. Alice was awarded an OBE for services to design and the arts in 2015 and was appointed as a member of the Honours Committee for Arts and Media in 2019. Born in Manchester, Alice graduated in art history from Cambridge University. From 1985 to 2001, she was an award-winning journalist for the Financial Times, working as a foreign correspondent in Paris and pioneering the FT's coverage of the creative industries. 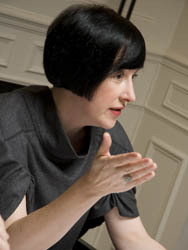 Alice was director of the Design Museum in London from 2001 until 2006, when she became design critic of the international edition of the New York Times. Alice wrote a weekly Design column for the New York Times for over a decade. Her columns were syndicated to other media worldwide. An honorary senior fellow of the Royal College of Art with an honorary doctorate from the University of the Arts, Alice has served on many cultural juries including: the Turner Prize for contemporary art; the Stirling Prize for architecture; the PEN History Book Prize; the Aga Khan Award for Architecture; the Buckminster Fuller Challenge; the Museum of the Year award; the Rome Prize for Architecture and Design; and the BAFTA film and television awards. She is a founding member of Writers at Liberty, a group of writers who are committed to championing human rights and freedoms as supporters of the human rights charity Liberty. A trustee of Arts Council England from 2006 to 2013, Alice was previously ACE�s lead advisor on the visual arts and chair of the Turning Point Review of the contemporary visual arts, which led to a record increase in public funding. She is a past chair of the British Council�s Design Advisory Group, a former member of the Design Council and the World Economic Forum's Global Agenda Council on Design. Alice was also chair of trustees of Michael Clark Company, the contemporary dance group, and a longstanding trustee of the Whitechapel Gallery in London. As well as contributing essays to a number of books on design and contemporary culture, Alice is the author of an acclaimed biography of the fashion designer Yves Saint Laurent. Hello World: Where Design Meets Life, described by the curator Hans Ulrich Obrist as "panoramic in scope, passionately argued and highly addictive to read", is published in the UK by Hamish Hamilton and in multiple foreign language editions. Design as an Attitude is published worldwide by JRP|Ringier.